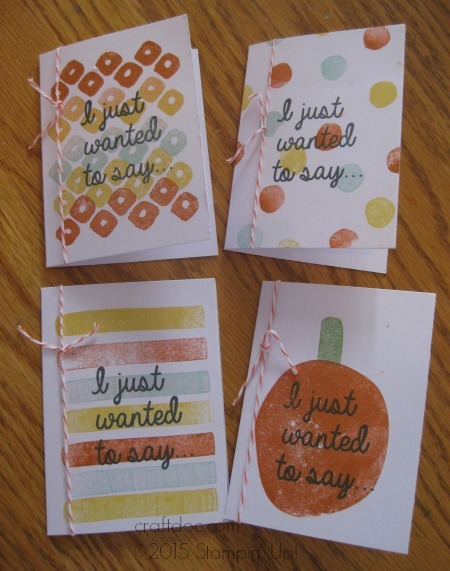 One of the nice things about Paper Pumpkin is the ink spots and stamp set that you can us over and over. I posted earlier my initial projects with the February kit. Well, the kits are so portable, that I took a couple with me to a crop I attended on Saturday. I worked on a Project Life album, then pulled out this kit for a nice break and made these simple cards. -for the first set, I just cut one of the accordian cards into 4 smaller cards. These are great to tuck into a gift. Or add an envelope made with your envelope punch board. -for the second set, I used ink spots from previous kits (guaranteed no duplicates in 12 months) and the notecards and envelopes sold in the annual catalog. I added some free SAB twine. Oh – I should have adhered the matching button to the side of the apple! -The 3 month, 6 month and 12 month subscriptions are available at a discount AND earn you a Sale-A-Bration Freebie! Get them here at my online shop under KITS. 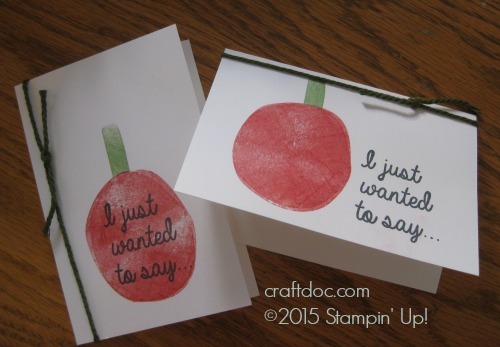 -The cards are stamped “thanks” on the inside. What a great teacher card!